After taking a drastic action that they thought would give them leverage over their employer, Walter (Bryan Cranston) and Jesse (Aaron Paul) have maneuvered themselves into yet another untenable position. 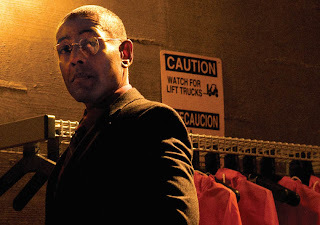 They both sit in the super lab that Gus (Giancarlo Esposito) constructed for them in the bowels of his corporate laundry with Mike (Jonathan Banks) and Victor (Jeremiah Bitsui) standing guard. As those two await Gus’s decision regarding their fate, Skyler (Anna Gunn) continues snooping while Hank (Dean Norris) deals with the boredom of in house rehabilitation. 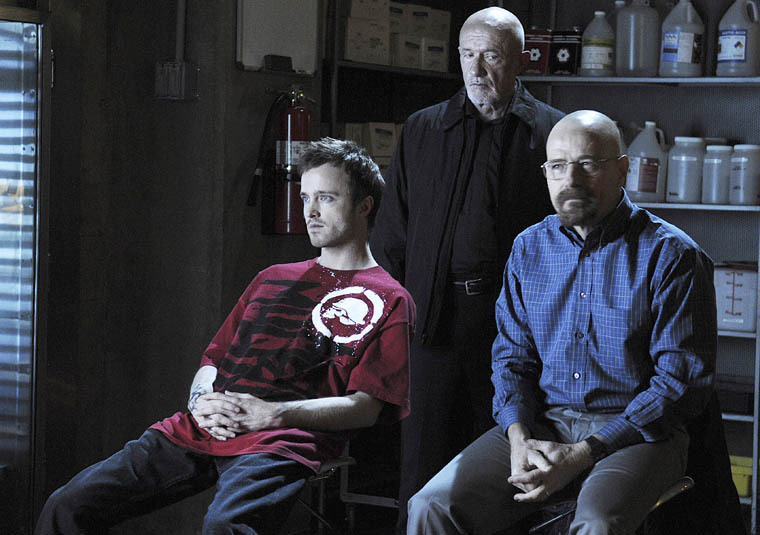 The finale of the third season of Breaking Bad ended with a shocking cliffhanger. A clearly shaken Jesse held the pudgy Gayle in the sites of a semi-automatic pistol at point blank range. Up until that moment, Jesse was shown to be a perpetual junkie screw-up with a soft heart. He fired a shot and the credits rolled, but we were still unsure as to whether or not he actually did the deed. Well, the premiere episode of season four, titled “Box Cutter,” answers that question while keeping many of the supporting characters in a sort of limbo. As always, Walt’s answer to one problem creates a plethora of new problems to deal with. Though highly intelligent and a quick thinker, Walt’s inexperience in the drug game prohibits him from having the necessary foresight. His relationship with Jesse maintains its previous trajectory. No matter how much Jesse may want to fully embrace the role of being a bad guy, he doesn’t have the heart or the strength of character to live up to such ambitions. At the end of the day, Walt will always call the shots, for better or worse. Throughout the entirety of this episode, Jesse barely utters a word, allowing his fate to be deliberated and decided by others. The pangs of guilt render him nearly mute. Gus’s character also has a bit of an evolution, or rather a statement of the obvious. He does something in this episode that leaves no question as to his ruthlessness. Until this point, the series had never shown anything that truly validated Gus’s “gangster,” so to speak. Well, “Box Cutter” effectively does so, and silences any doubts as the characters willingness to get down and dirty. Gus is quite a contrast to Esteban, the sleazy Brooklyn heroin dealer with delusions of grandeur that Esposito played in 1994’s classic hood flick Fresh. Gus would never accompany his men on a hit, or allow his feelings for a woman to interfere with business. The other characters go through the motions, being exactly who they were at the close of last season. Skyler continues to try and find a happy medium between her disgust with Walter and her need to keep up appearances for the sake of her family. She engages in a bit of deceit that is funny, but feels like a distraction from the main storyline involving Walter and Jesse. Hank is still feeling like less of man as he grunts and grumps his way through physical therapy. 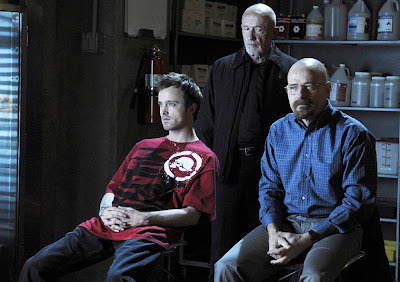 While these subplots are necessary to the overall scope of Breaking Bad, they feel kind of mundane compared to the drama of Walter and Jesse’s predicament. 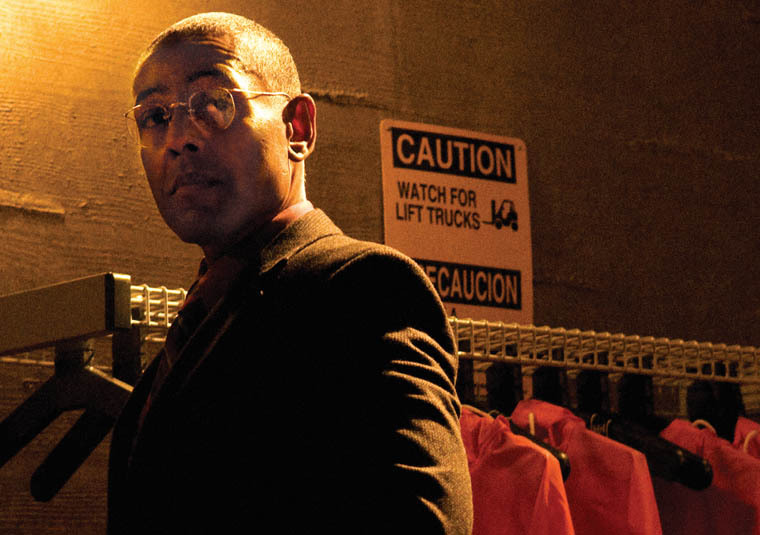 “Box Cutter” is a solid if not phenomenal start to the fourth season of Breaking Bad. It’s nice to see that the series creators have not let Jesse off the proverbial hook, forcing him to deal with his choice of accepting his role as a villain. It’s also interesting how a single shocking event makes an otherwise routine episode worthwhile. Walter and Jesse continue digging themselves into an already bottomless hole. One wonders how much more convoluted the plot can get and still maintain plausibility. HBO’s OZ failed miserably, while The Shield did a pretty good job of holding things together. I have a feeling that Breaking Bad will follow in the path of the latter.